We’ll continue to say the best path to success for the USC offense, particularly on the road in a loud environment such as the one they will face on Saturday, is to rely on the trio of running backs to lead the way. Do you think Aca’Cedric Ware wants to have a big day while returning to his home state? Add Stephen Carr and Vavae Malepeai and you should have a group that is capable of carrying the load while taking pressure off J.T. Daniels and allowing the freshman to serve a complementary role, which should still result in good production. Last year the 6-6 Longhorn receiver had seven catches for 191 yards against the Trojans, and was a big reason why Texas was able to stay in the game and force double overtime. 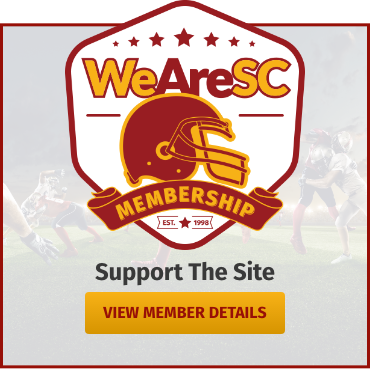 The USC secondary needs to find a match-up that works (Iman Marshall?) to take away this key weapon from Sam Erhlinger. OK, this isn’t a match-up of top 10 teams, not even a match-up of undefeated teams. 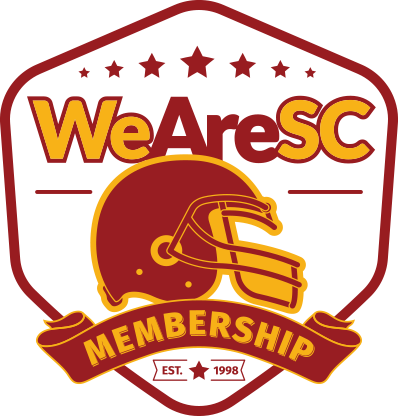 But it’s still USC and Texas, and I’m going to assume the Longhorns will be ready, just like they were ready last year. The Trojans found a way to win that one, but they are coming off a performance last weekend against Stanford that was uninspiring on offense and resulted in a loss. This game gives Helton and his team the opportunity to bounce back quickly if they can find a way to play with Trojan pride. 1. Score touchdowns. Yes, that sounds flippant, but you normally don’t win games without scoring TDs. The Trojans have gone four consecutive quarters without crossing the goal line, and they need to get 6 points early in the game – like the first quarter – to get that monkey off their back. If not, then the Men of Troy could become focused on the potential of being whitewashed through the ensuing quarters. Texas proved last season that they can still play a tough brand of football, so scoring early and, hopefully, often will put the Trojans in a position to win. 2. 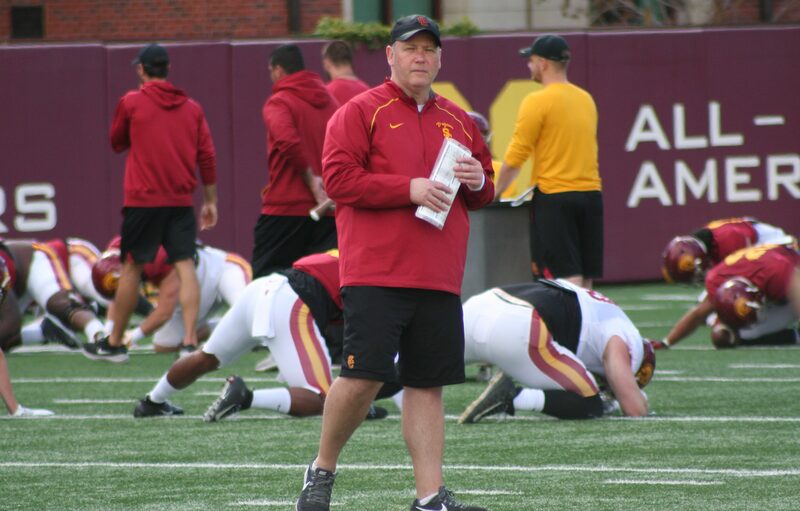 Offensively, the Trojans’ coaching staff has to find an identity and stick with what’s working – whether that’s run or pass. It figures that running the ball would be the first and preferred first option, but the Texas defense might not be so accommodating. Last week against Stanford, when the Trojans were having nice success running the ball, the staff elected to throw the ball repeatedly. You know the old saying, “If it ain’t broke, don’t fix it.” Obviously, if the Trojans find they can’t run the ball, then more creative ways – the use of misdirection, screens, draws, and tight ends – could counterbalance the Texas defensive surge and keep the burnt orange off balance. 3. 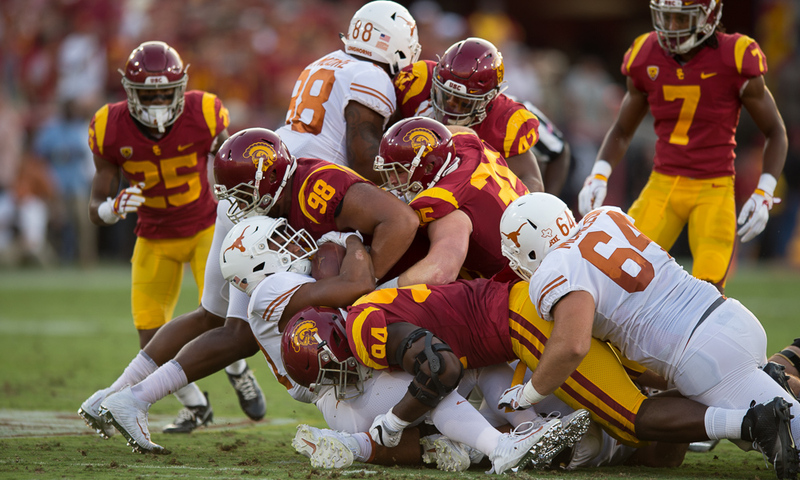 Defensively, the Trojans need match the physicality of the Texas O-line, and the secondary must play better in terms of pass defense. The Longhorns have some fine receivers, and the quarterbacks are seasoned. The Trojans’ defense – along with offense for that matter – must maintain its poise, energy, and spirit – in what figures to be a very hostile environment that also may include factors such as Texas heat, humidity, and potential thunderstorms. 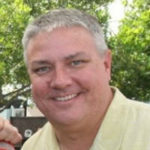 * Red Zone efficiency – the Trojans simply have to score points when they get into the Red Zone, preferably touchdowns. Finding the right formula with a young QB can take a few games, and the Trojans have seen it fall into place in past seasons. But JT Daniels has to grow up fast, and the coaches have to find the right combination of plays that puts the team in the end zone. * Win the Turnover Battle – as with all road games, limiting turnovers on offense and creating them on defense is a key. Nothing gives the home team and its fans momentum like taking the ball away and giving its side an extra possession. So the Trojans have to take care of the ball on offense. And an opportunistic Trojan defense would create better opportunities for an offense that could use a “short field” to work with right now. * Forget About the Past – college football is a week to week business . . . win or lose, the previous week’s game cannot linger and produce a lack of confidence or over-confidence. The Trojans must come into Austin with a sense of purpose and continue to believe in each other’s ability to put it together for a win.